However, the Scots do celebrate in the evening, with many eating traditional Scottish food, such as haggis, neaps and tatties, Scotch Broth, stovies, or if you live in Glasgow, a deep fried Mars Bar supper!! Later in the evening, many will go to various events, such as Ceilidh’s (Scottish country dancing), story telling events or bagpipe events. St Andrew, the alleged brother of Simon Peter, was a fisherman, born in Bethsaida, on the Sea of Galilee, and became one of the 12 apostles of Jesus. When Jesus was crucified, Andrew allegedly travelled to Scythia and the Black Sea region, as far north as Kiev, to preach the word about Jesus. Therefore, he is not only the Patron Saint of Scotland, but also of Ukraine, Romania and Russia. He is said to have been martyred by crucifixion, the earliest historical references suggest this was by an upright Latin cross. But later references, which became established in the Middle Ages, suggest that he requested to be crucified on a Crux decussata, or saltire, as he deemed himself unworthy to be crucified on the same type of cross as Jesus. Relics of St Andrew were taken to various corners of the world. According to legend, Regulus, or St Rule, had a dream telling him to take Relics (a upper arm bone, a kneecap and three fingers) of St Andrew, by boat, to “the ends of the earth”, and he was shipwrecked off the coast of Fife, at St Andrews, which became a shrine. However, it seems more likely that the relics were brought to Britain in 597 AD by an Augustine Mission. These were then taken to Fife by Bishop Acca of Hexham, after he was driven away from Hexham in 732 AD. 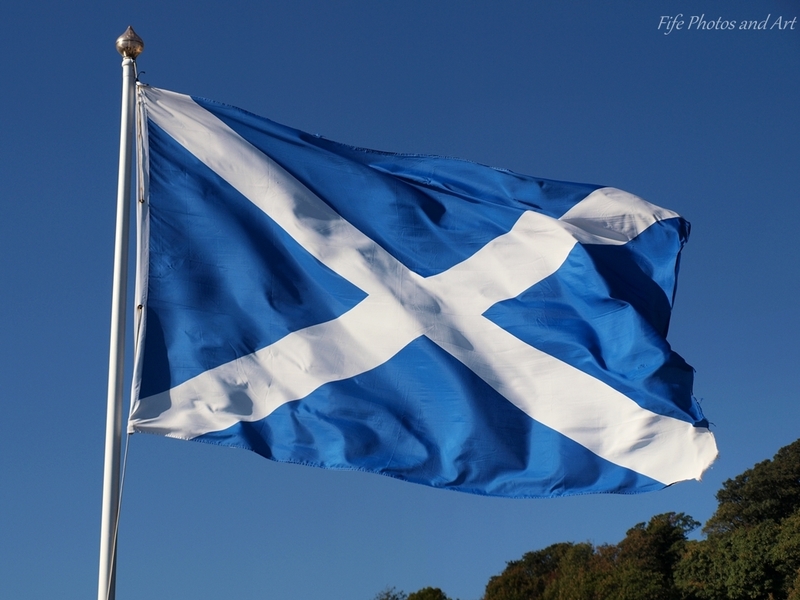 The Scottish National Flag, the Saltire, is also known as St Andrew’s Flag. The first use of the Scottish Saltire as the national flag, appears during the reign of William I of Scotland in 1180. Legend has it that Scotland’s association with the saltire, originated in a 9th century battle, where Oengus II led a combined force of Picts and Scots to victory, over a much larger force of Angles, led by Aethelstan. Supposedly, the white clouds formed a large white cross on the blue sky just prior to the battle, and this roused the Scots to a heroic victory. 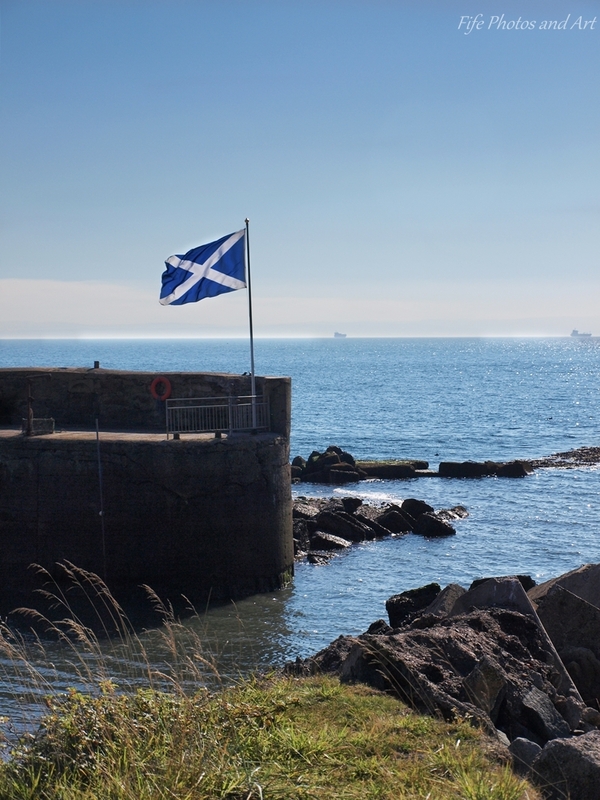 This entry was posted in Fine Art Photography, History and tagged beaches, Fife, harbours, landscape photography, Saltire, Scotland, Scottish icons, St Andrew's Day, St Andrew's Flag, West Wemyss. Bookmark the permalink. 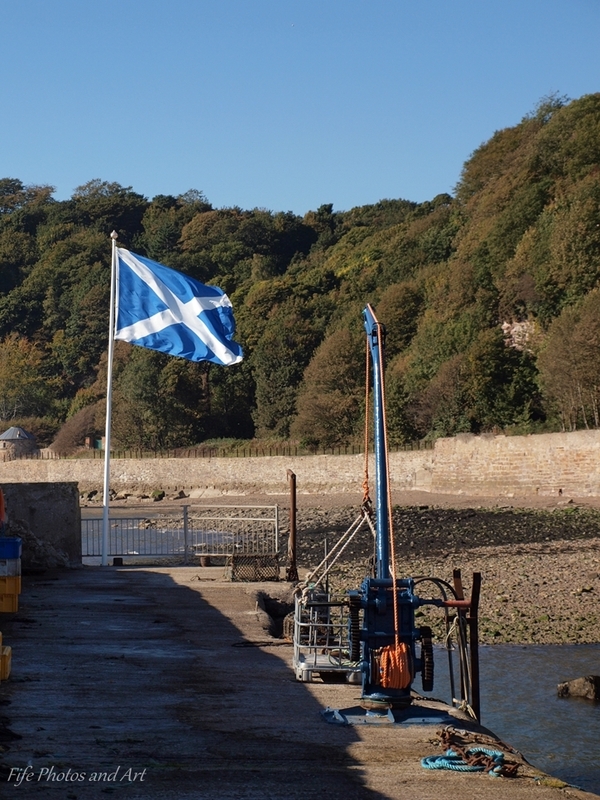 Absolutely fascinating and the photos of the Saltire against the blue sky are perfection! Thank you, I didn’t know the name of the flag, and for the history. Nice pics and potted history, Andy! Thanks Jo, and it was a wee bit potted!!! Lol!! 🙂 Unfortunately my writing skills aren’t the greatest, I couldn’t think of a decent way of wording it, so that it fitted in with the photos of the Saltire. Thanks Lynne 🙂 Those lovely blue skies and warm days of late September seem a long time ago now! 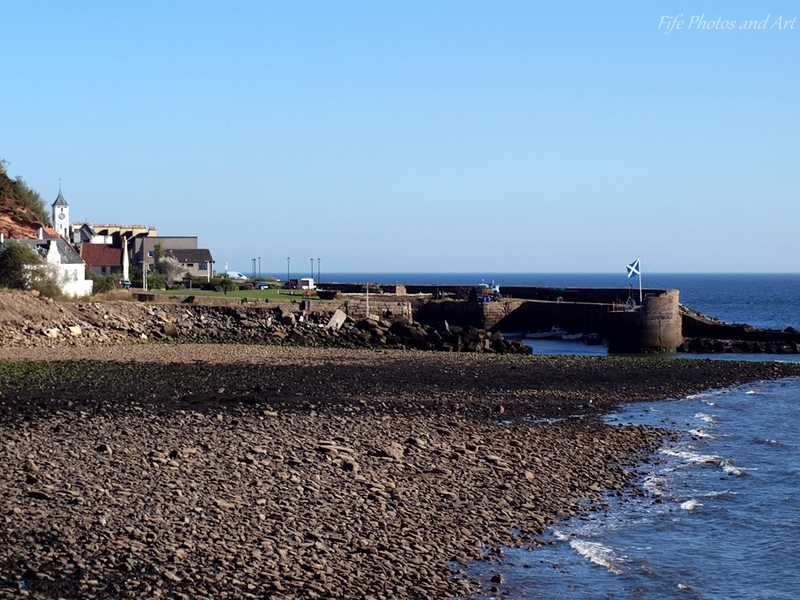 There’s a real freshness with Blue and White … flag and skies ! The whole idea of Relics seems rather odd in this context. You have a famous reverential person who is killed, and then you take their body and chop it up and send bits to various parts of the world. That would be classed as barbaric nowadays, but it is just accepted because it’s for religious reasons that it’s done. I think different countries have various other bits of him, and likewise with religious Relics of other saints. 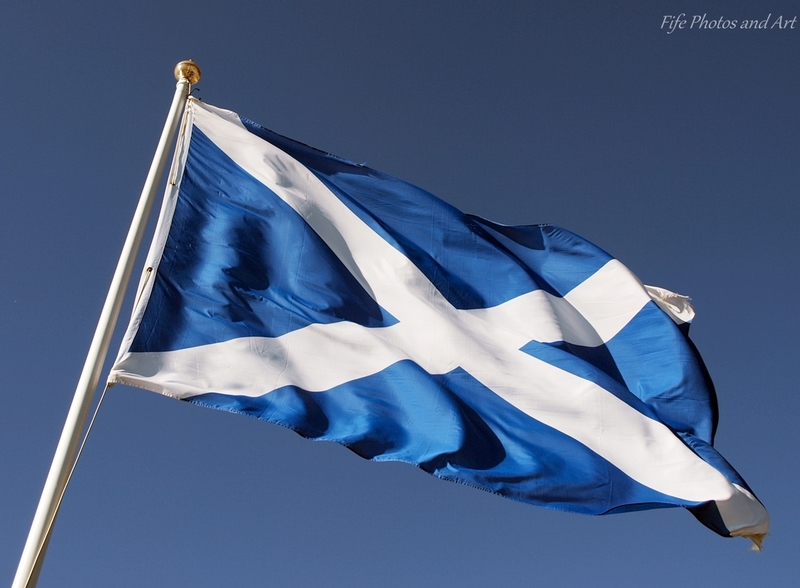 Very interesting about St. Andrew, and about the Scottish flag. I didn’t know it was called the Saltire, or that its use dated back to 1180. Thanks Millie 🙂 I think most Scots call the flag, the Saltire, very few call it the St Andrew’s flag.